You are not reading these words right now. In fact, you read them a fraction of a second ago and are just now catching up consciously to what your brain did subconsciously. In fact, your eyes are not even pointing exactly where you think they are – they are just a little bit ahead of you on the page. We live a fraction of a second in the past because no information can travel instantaneously. Like piloting the Mars rovers, we have to wait for signals to reach us and then for the signals we send to reach our hands, mouths, hearts and so forth. The decisions we appear to be making now were really made a short time ago by reflex, instinct, and the subconscious and we are now justifying our actions or feeling guilty about them. Did you ever dream of the alarm clock going off just before the actual sound? Did you ever reach for the phone an instant before it started to ring? This is precognition at its finest: you heard the sounds before you knew you heard them, and your body reacted before you had processed the information and decided to act (or not act, as in the case of the alarm clock). It has been shown to be shockingly easy to manipulate people into doing bad things, like abusing prisoners or giving high-voltage electrical shocks to people with heart conditions – or even marching innocent people into gas chambers. Fox News has convinced millions of people to vote against their own best interest. Television advertising is masterful at playing on your unconscious action. You see, free will does not really exist in the present moment – there is no such thing as the “present moment” for us. We live in divided time: the majority of us that is subconscious exists closer to the real moment; the part of us the thinks in words exists further from it; and neither of these selves can act in real time. This moment is a fallacy that we just have to deal with as truth the best we can. Nor does free will exist in the past. In a deterministic universe, everything that has happened had to happen because that action conformed to the laws of physics. Every decision we made we were conditioned to make and acted out unconsciously, later justifying that decision as conscious and intentional and right – or lamenting it. It is possible, however, that some degree exists in the free will. Sometimes we are in non-decisional moments. In those moments, we can reflect on our values, goals, ideals and intentions. We can pause and let ourselves catch up to the moment. It is in these pauses for reflection that we can begin the process of self-conditioning. Every action is reflexive or instinctive until we train the instinct to pause for breath, and then we might have a moment to reflect. But where do instincts come from? An instinct is not just some primitive response you were born with like sucking or grasping. It is any action you undertake without thought, faster than reflection. We can train our instincts to do the right thing for us. For example, we can teach them to mistrust authority – making Milgram’s experiment come out differently. This is part of why we teach Milgram so heavily in undergraduate courses: to build some appropriate resistance to authority. We can learn to mistrust peer pressure, making the Stanford prison experiments come out differently. The kids at Abu Ghraib would have stood a much better chance of doing the right thing in the moment had they been exposed to Zimbardo earlier in their careers. You cannot decide what to do in this moment, because this moment is already passed and you already acted. But you can become the sort of person who acts better in each moment. Then, when the moment comes, your instincts have aligned with your intentions and values. Fewer of your decisions are lamentable, and more are justifiable. The other approach, as alluded to earlier, is to change the way we are detached from time. Rather than act in the moment, make your first action in every situation a pause for reflection. When something happens, stop and think. Time will pass, even the fraction of a second you need in order to catch up to the moment, and your decisional mind can operate on the circumstances. The Mars rovers are slow – even if they could be made fast, our reaction times over millions of miles of space are not sufficient to the task. Slow down. Now you have learned not to act too hastily but to pause and reflect. Rollo May taught us that freedom lies in this pause for reflection, in letting intention catch up to time. You can only act intentionally by slowing down. Freedom lies not in this moment at all, but in the future. We can spend this time becoming the people we want to be, the people who resist peer pressure, who resist illegal orders, who resist becoming subsumed in the mob mind, the people who act when they see trouble rather than becoming diffused in a crowd of onlookers who also do not act. What will you do now, as we understand the now, to be the person you wish to be when destiny calls upon you? This is an important question. Every moment that passes, passes for ever. It never comes around again to offer you the chance to act differently. 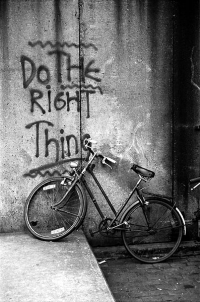 You only get one chance to do the right thing. You must thereafter live with the consequences.